Salvaged bedposts, table legs, chairs, head and footboards, crib rail, and a blanket stand. 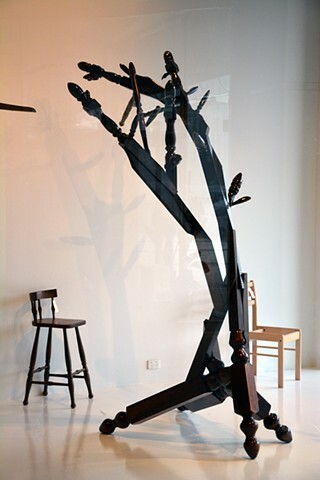 The items in the install consist of four “trees” made from broken timber furniture reclaimed from the local dump displayed next to their source materials, the reclaimed discarded chairs that have not yet been deconstructed. This installation stems from research into rates of world timber harvesting, global consumption of new wooden furniture, and municipal waste per nation measured through landfill growth. Re-Forestation addresses repercussions of consumer culture, specifically the out-of-balance cycle of casually discarding older, yet salvageable, furniture and so easily replacing it with cheap, semi-disposable furniture. The prevailing manufacture/consumer system overlooks the true costs of timber harvesting, underpaid labor, and garbage. The ratio between the time and resource it takes to grow a tree and the fleeting lifespans of contemporary furniture is perverse. Working with the local tip, I have retrieved abject and abandoned wooden furniture destined for landfill, and have regenerated the timber for a third life, a return to trees. These trees are not realistic arboreal renderings, rather harbingers of what we will be left with when input to landfills outpaces the stewardship of forests.